Have been working on 2 models of the James Miller at 1:300 scale and thought I would share some progress photos and info. 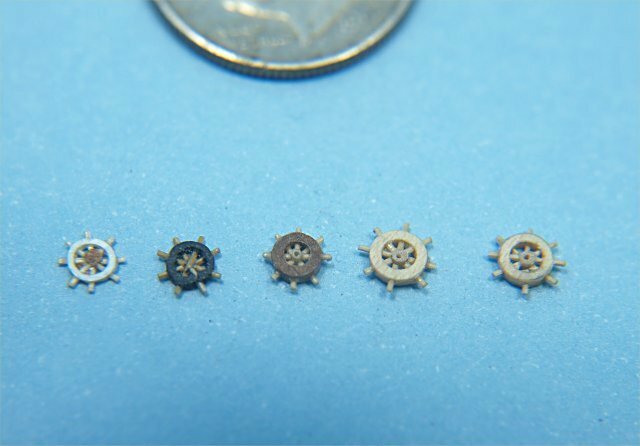 One of the models will be going into an 11" long sodium vapor street light bulb, the other in a wall mounted clock that resembles a pocket watch case, the latter will be static display. I've been working on the models for about 8 months now, on and off. Both hulls are split at the waterline, to allow access to the underside of the upper hull, and to fit through the light bulb opening. 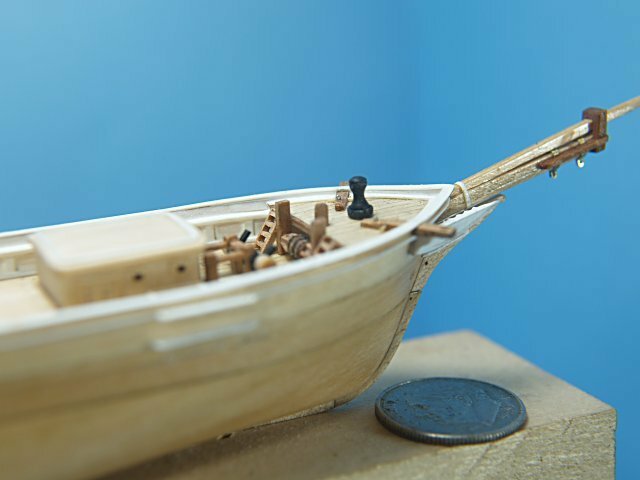 I decided to try something different with these models, the hulls are carved from solid maple, instead of the basswood I have used for hulls in the past. It it a bit more difficult to carve to shape, but much stronger. 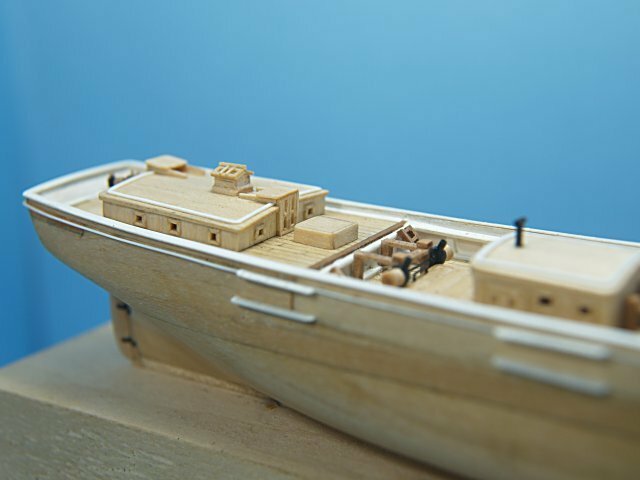 The upper hulls were carved to the decks, then a solid piece was carved to match both the forward and stern decks, the forward longer section was pegged to the deck, the small stern piece was just held in place, then both were carved to the outer shape of the hull. Both pieces were then "hollowed out" to about 1/16" thick. 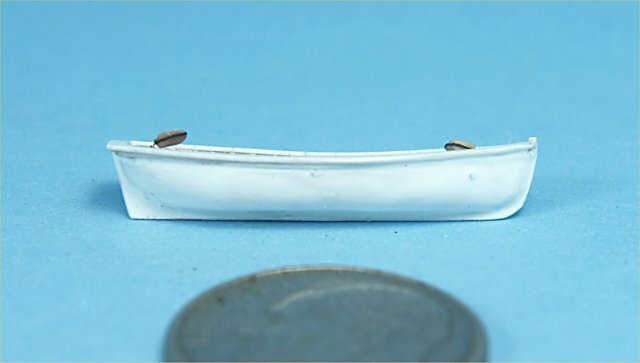 Maple keel was added to the hull pieces, then the interior of the forward bulwarks piece had styrene frame tops added, along with a styrene pin rain added their entire lengths. 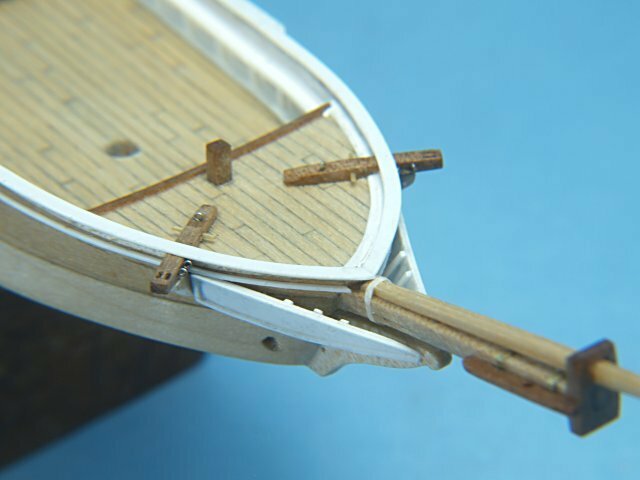 A 1/32" forecastle deck was then cut to shape, and glued to the tops of the pin rail on either side. 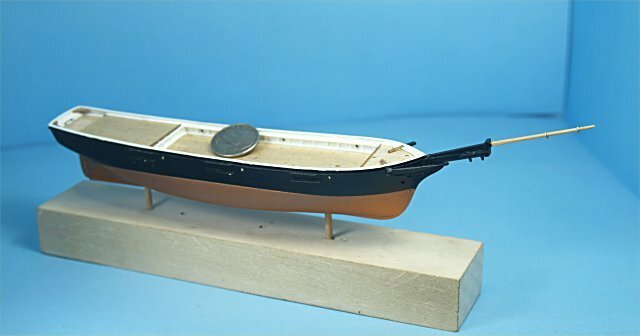 A styrene top plate was then cut and glued to the tops of the bulwarks of the entire hull. 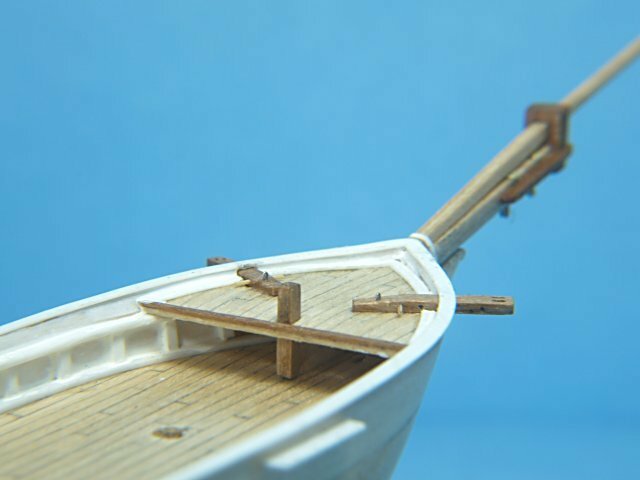 The bowsprit was made from maple, the jib boom was made from glued maple laminates for strength. 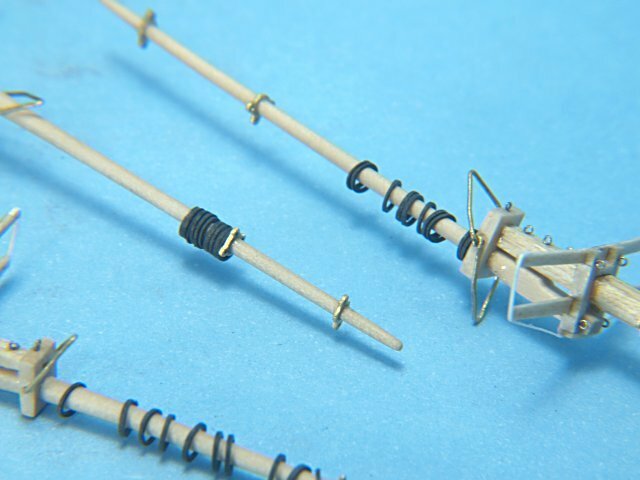 The light bulb model had laminated lower masts, to make it easier to add hidden hinges for that model. All the other spars I made from solid apple wood, which is different from my usual techniques. The apple wood is amazingly strong, even when cut and sanded to small diameters, and nearly grain free. 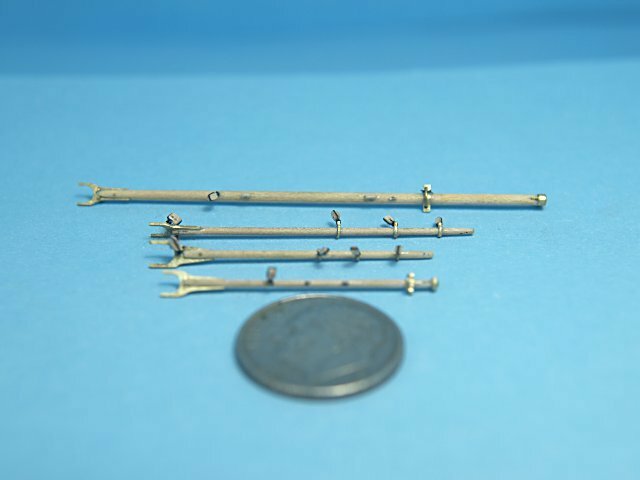 Most of the spar attachment points for rigging were cut and filed from various thicknesses of solid brass, thin brass shim material was used to make some of the attachments, like for the bobstays and boom sheet and topping lift attachments. 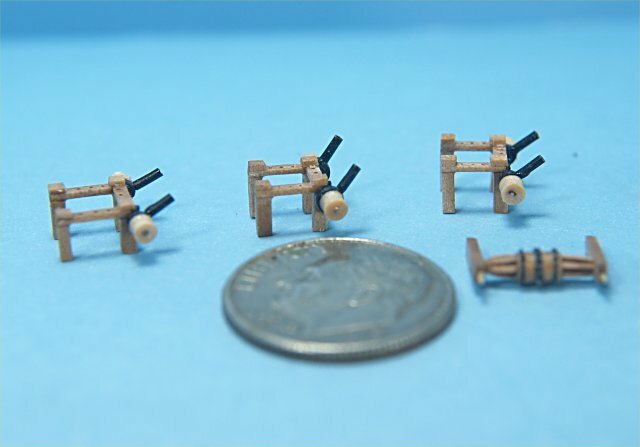 The boom and gaff jaws were cut and filed from 0.20" thick brass, mainly for strength. One of the reasons for the lengthy build of these models is my attempts to try different methods and materials. 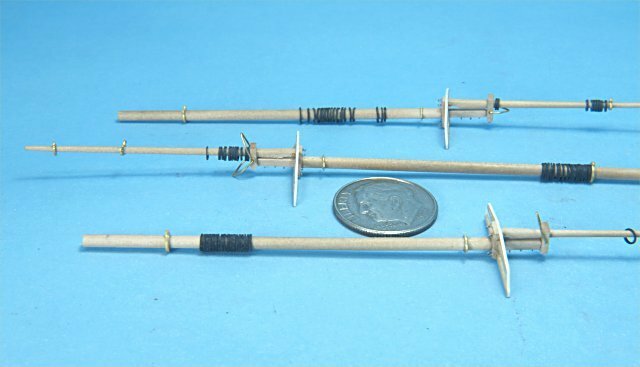 One of my better "finds" for these models was the use of electrical shrink tubing for the mast hoops. I used a wooden dowel a bit larger than the thickest part of the masts to shrink 1/8" diameter tubing to size, by heating the tubing carefully. 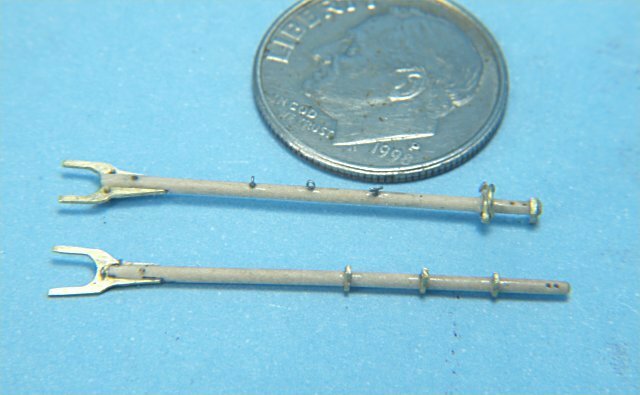 A single edged razor blade was then used to cut thin sections of the tubing for the hoops. When I shrank down the upper mast hoops I found the shrunken tubing was too thick, so I used various grades of sandpaper to spin sand the tubing to take the thickness down. 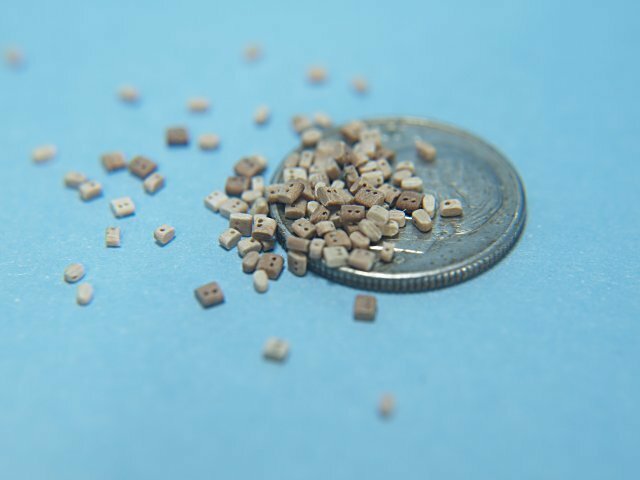 I would have preferred to have used brown shrink tubing, but while there are a variety of colors available, brown was not one of them. 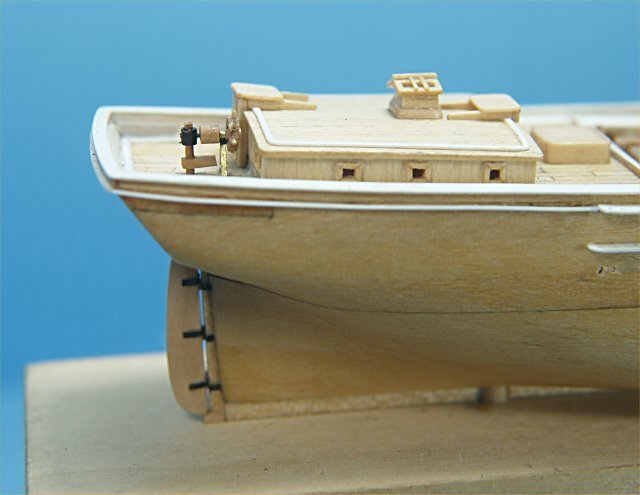 The cabins for the models were made from maple, started with a core building of 1/32" maple veneer longer sides, with 3/32" maple ends, and a similar thickness maple inner piece for strength. The door and window openings were then cut through the side panels. I then glued 0.010" thick maple "planks" to the outside of the cabin. Very tiny pieces of the thin maple were then cut and glued for the door and window frames. I decided to let one door partially open on each cabin, just to show the hollowness of the cabins, the doors were made similarly to the cabins themselves. All the decks of the model were planked with the same 0.010" thick maple, the maple was hand sanded down from the 1/32" thick veneer that I have a good stock of. The planks were then cut and sanded to size, and a soft lead pencil was rubbed along one long edge and one short edge of each plank. The planks were glued to the decks with thinned white glue. Very impressive. I like the use of the various woods. 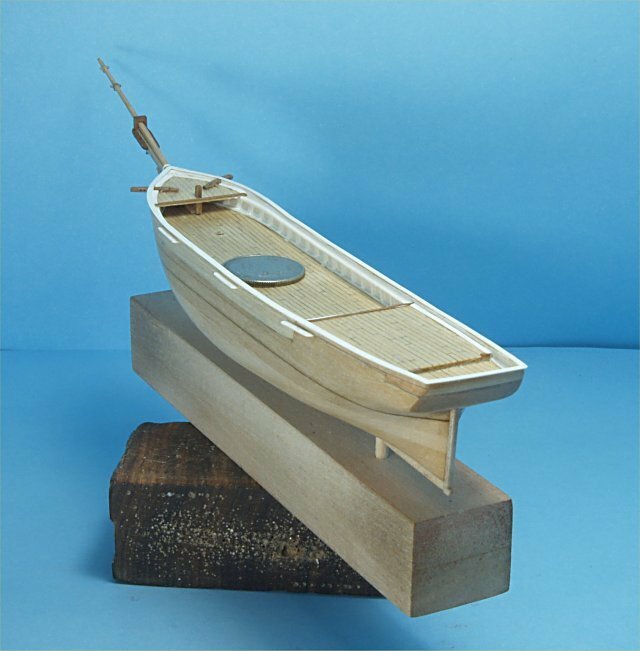 I had another model shipwright suggest cherry to me and I've found its a nice carving wood. Its much like your maple. Harder to carve but holds its shape well. The apple sounds interesting too. I didn't realise it was so strong. Good find on the tubing, that looks great. Mast hoops aren't easy in general but at this scale they even harder. The right materials really do help. Another lovely bit of work, John. Looking forward to seeing the rest of the build. Wow, that's very, very nice. Thanks for the tips. When I first tried the apple wood I was surprised that it was both strong and stiff enough at very small diameters for the spars. I did a little checking online, and apparently some fruit woods, including apple, have extra membranes that grow across the "normal" grain of other woods, which makes it much less likely to split at even small sized pieces. So far as I can tell, this is true. I've had some apple wood given to me, and some from ebay purchases, the gifted wood was a darker brown color, while all the ebay apple wood was pure white with only tiny imperfections, knots. Thanks to all for the kind words. While progress is slow, I will post when I have accomplished. Beautiful work John. I too love the use of natural woods, and try to "paint with wood" as much as possible on my larger scale models. I haven't worked with apple yet, but have heard similar experiences as to workability. I've used maple before and really like it - a very hard wood with great workability. After seeing your deck houses though, I now feel like the ones I started working on are inferior and might have to try to build them up as you have (though mine are smaller scale, and I think after looking at the size, I'm not sure that I can replicate your work). Yours are absolutely fantastic! Thanks for the kind words! 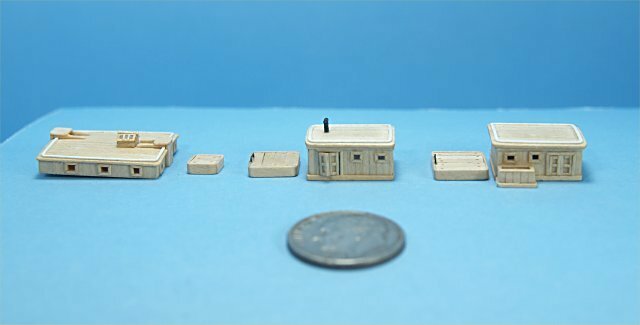 Making those cabins was a real pain, somewhat like styrene plastic tiny pieces of wood, such as the frames around the windows and the entire doors, due to static electricity. Sometimes it's nearly impossible to put a tiny piece down, or keep it in place until a tiny amount of CA glue can be applied. 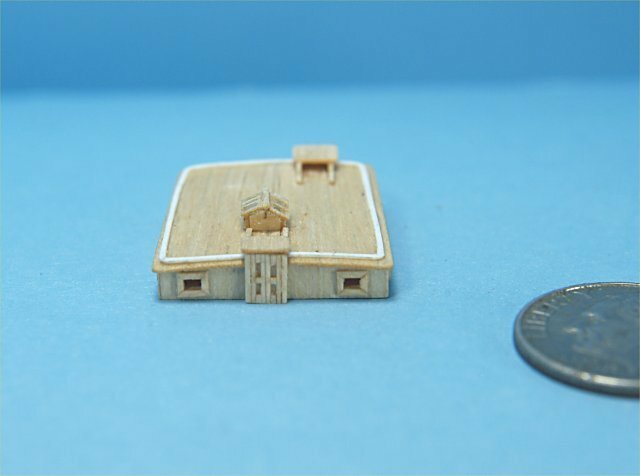 I have yet to decide if I will paint the cabins white, except for the roofs, if I do I expect I will try to use just a white wash of paint, so that the actual planks added to the sides can be distinguished. 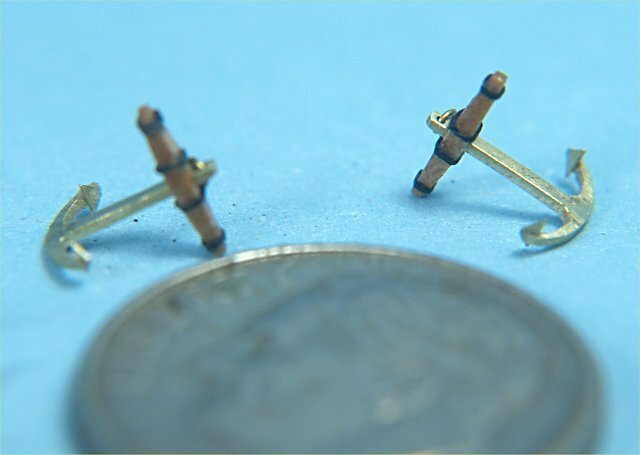 Latest work on my James Miller model pair. Finished up all the cabins and deck structures, first two photos show the cabins. Nest two photos show different views of the fife rails that are situated around the 3 masts. This ship had an interesting feature of ratcheting windlasses, they are the black circles just inside the windlass with the small tubes sticking out at 45 degree angle. They would turn the windlass on the down stroke and ratchet freely on the up stroke, wood or metal poles were pushed into the tube ends to operate. Never saw anything like this before and found it an interesting feature to work out in miniature. Fifth photo shows the main anchor barrel windlass, the fore deck capstan for raising the anchor out of the water and the ship's wheel. 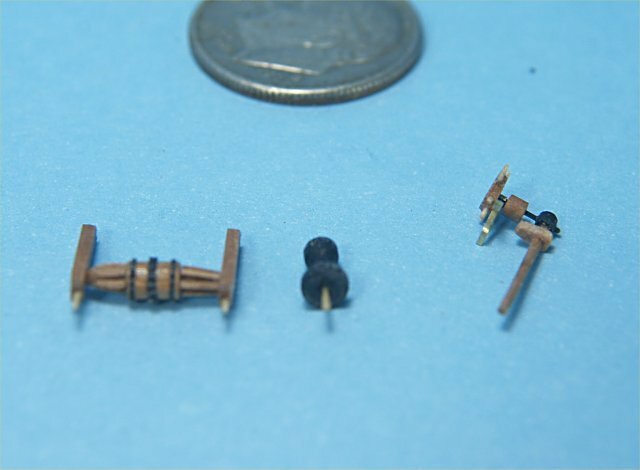 The last photo shows some of the many attempts I made to manufacture the ship's wheels needed for the two models. The first was made by simply gluing some drawn down bamboo together, then cutting circles from .005" thick styrene plastic, and gluing them to both sides of the "spokes", added a tiny center circle of paper. The second attempt I made using shrink tubing, larger diameter tubing that was shrunk down around a small diameter drill bit shank. The shrinking increased the thickness of the tubing, I then drilled holes and inserted the same bamboo spokes. Both of these methods worked OK, but did not have a decent method to attach to the horizontal "arm" of the entire mechanism. 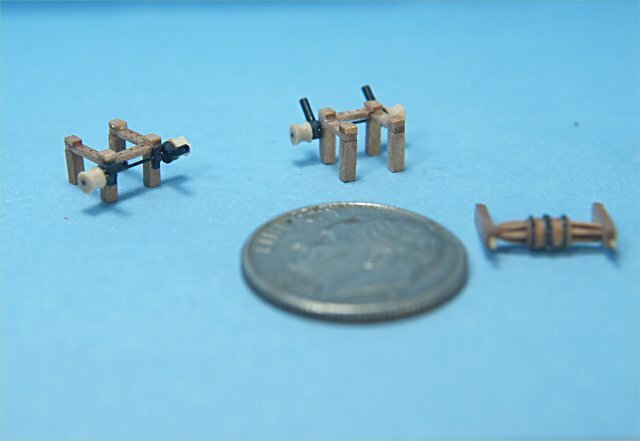 The third and fourth wheels were made by drilling a hole in the end of a piece of apple wood, then sanding the outside to get a thin walled tube. Holes were drilled in the tube near it's end, and the bamboo spokes added. The difference with these was that I made an extremely small diameter tube from apple wood, and glued the spokes to this in the center of the wheel. This gave me the perfect method to mount the wheels. The last wheel shown was made by making up a cross grained plywood from nearly paper thin maple wood, then drilled the holes and adding spokes and center piece. I had tried this earlier, but had difficulty drilling the holes without splitting the wheel. On this final attempt I saturated the inner and outer surface of the wheel before drilling and that seemed to work. Sixth photo shows the 100 apple wood blocks I made for the models. There are 40 double and 60 single blocks, my "guestimate" of the number needed for the two models. 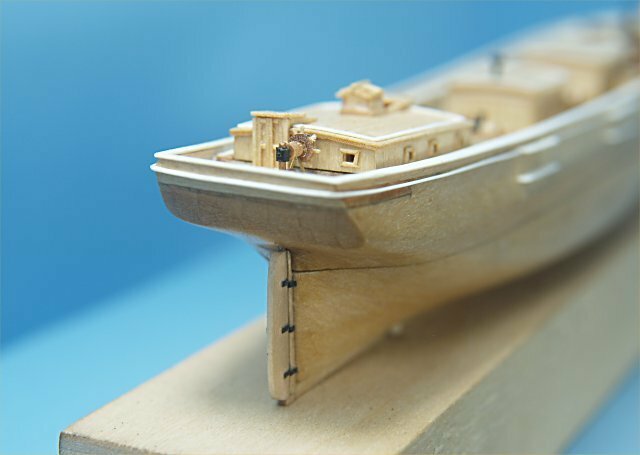 The remaining photos show the deck structures on one of the models, non of the structures is permanently mounted at this time, I just placed them as well as I could for the photos. I need to mask off the deck areas to air brush the hull parts, so needed the clear decks to make it easier to tape from cap rail to cap rail for masking. Be happy to answer any questions anyone might have. Those blocks look interesting, are they drilled pieces of strip wood? Looking forward to the rest of the build. Fantastic detail as usual John. This ship looks really good now. I can only imagine what she will look like when complete. The wheel and windlasses are a work of art in themselves. Looking forward to further posts on your progress. Thanks for the tip Alan! The block are indeed strip wood drilled, with strop grooves in the non drilled faces. I hope to add grooves to the drilled faces as I install each block. They are made from both light and dark apple wood. Beautiful work. Shes coming a long nicely. I've just been reading through from the beginning again and noticed that the light bulb you are going to use is a sodium vapour bulb. I know precious little about chemistry. Are there any special precautions ref the vapour you know of when opening one of these. The reason I ask is I was gifted a large bulb a few months ago of uncertain origin and am a bit cautious of using it until I know there is nothing nasty in it. As far as I am aware it is safe to "open" a sodium vapor bulb. I've opened at least half a dozen of them and taken no real precautions about what vapors might be inside. All of the bulbs I have used have been "used", and probably burned out, that might make some difference I just don't know for sure. My source was a friend who knew someone who's job was replacing burnt out bulbs, and he just kept a few for his friend. When I decide what to do with it, I think I'll still open it in the great outdoors just in case. Finally got the hull air brushed, flat black upper hull and copper lower hull. The cap rail is still white as I have to add solid railings and boat davits before painting the rails black. 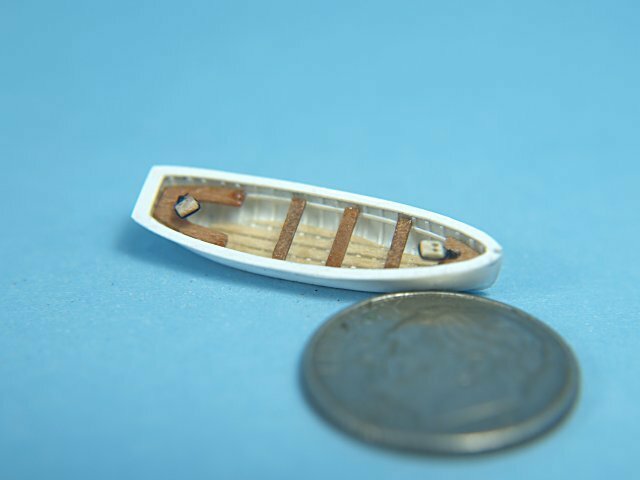 Next we have the ship's boat for one model. There were two made, one for each model, using cigarette papers over a bone mold. The ribs and cap rail are plastic, the floor boards and thwarts are made from light and dark apple wood. The blocks have been added to hang the boat. Then we have the spars with their blocks attached. I try to add all the blocks and tackle to the individual parts before installation as space is restricted once they are installed. 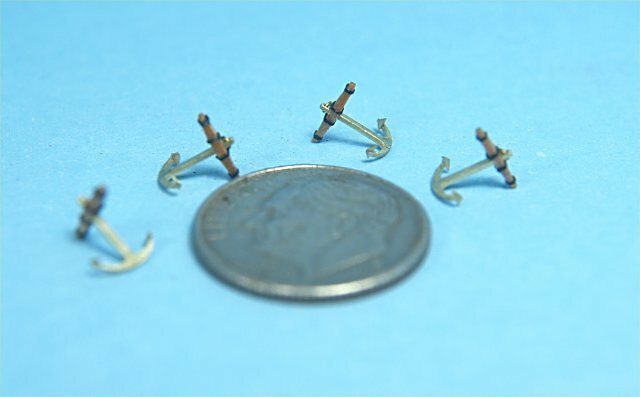 Last, but not least, are the four anchors for the two models. They were made by cutting and sanding 0.02" thick brass sheet, then adding apple wood and black thread to finish them off. Nice work John. Detail is wonderful. Thanks Gwyl, I do try! 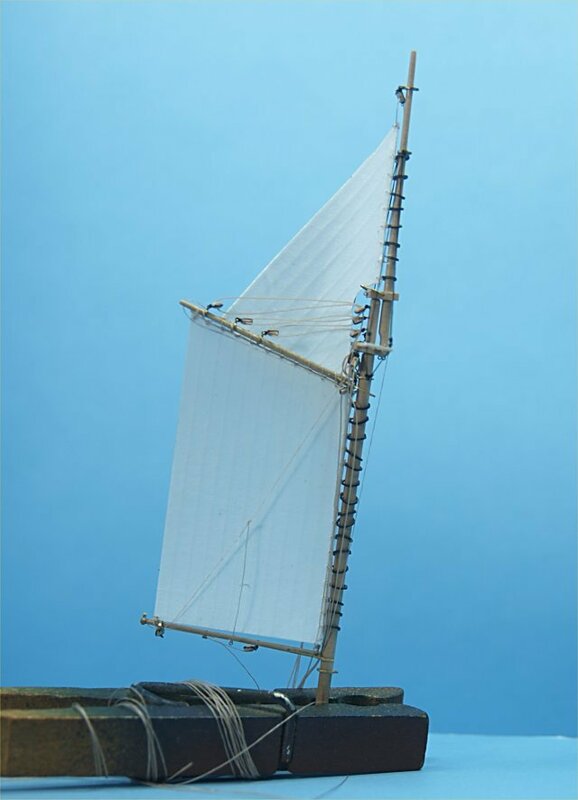 I am working on a new method for sail making that I hope to share sometime in the near future, will post when I see if it works out. Beautiful work as always John. 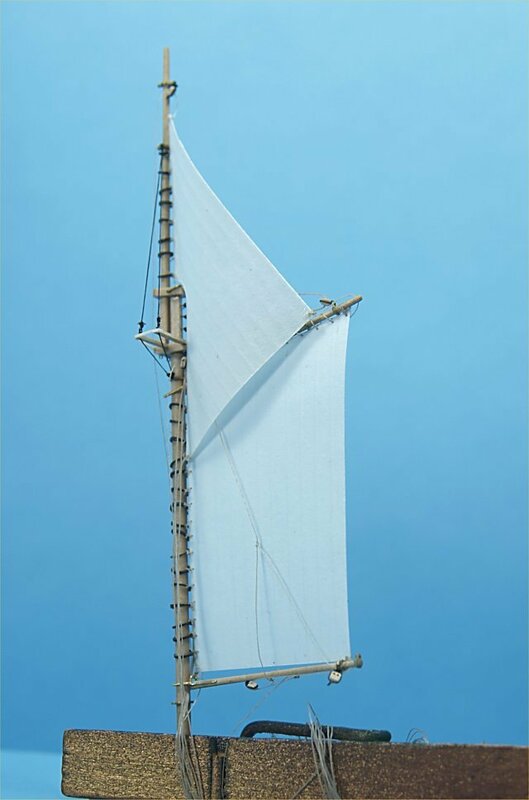 In my attempt to get realism I have been working on some ideas for sails. 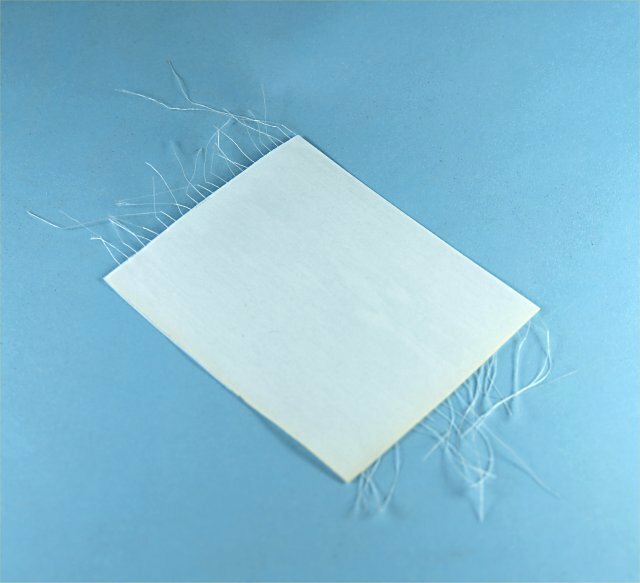 Rather than printing seam lines on paper, my usual method for making sails, I tried out the idea of using thread sandwiched between layers of very thin paper. It took a number of attempts, using different threads and various papers, until I came up with something I think works quite well. 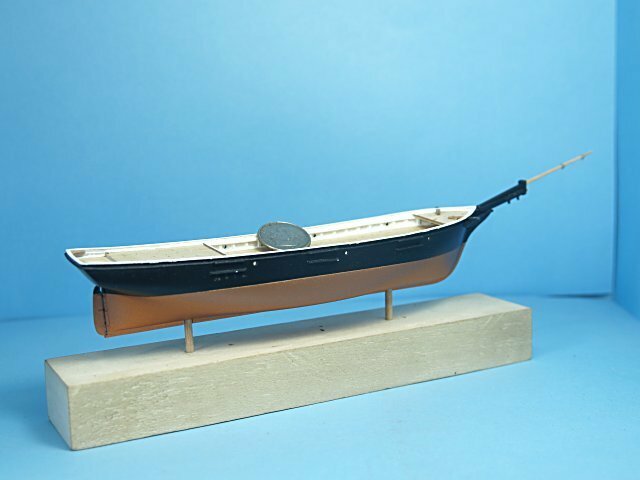 The photos below show first one of the hulls with the stern bulwarks added, with the boat davits, and painted black along with the top of the cap rail. Then for the sails, there are several shots showing my sail jig, with bamboo pins spaced where I want my seam lines to be, then strung with 8/0 white fly tying thread. I kept the thread under some tension, while stringing the jig. 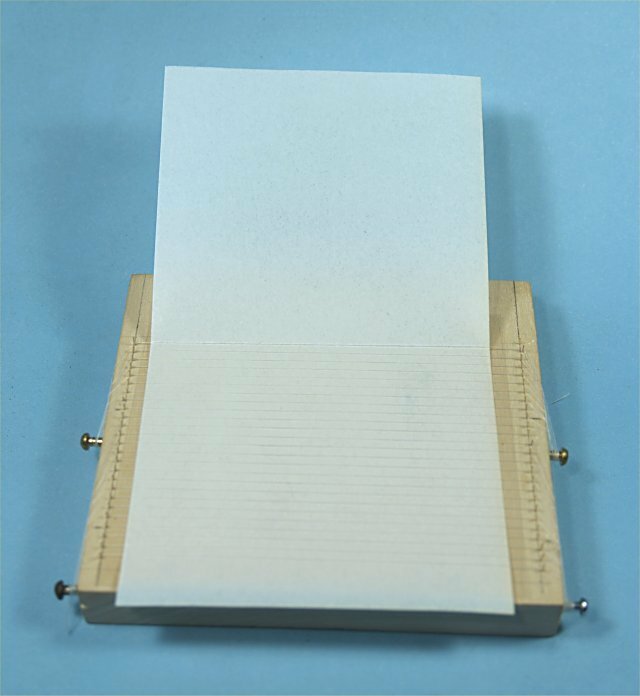 Beneath the threads is first a small sheet of .003" thick clear acetate, then a folded sheet of .003" 100% cotton drafting paper, with half the paper under the threads. 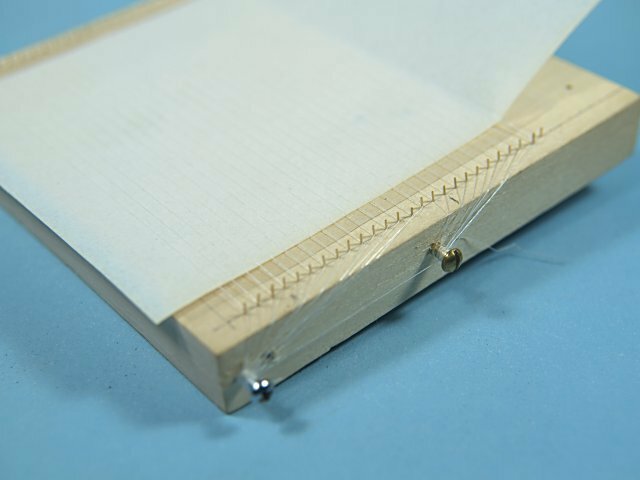 I found it easier to add threads to the jib after the layer of acetate and paper, rather than slipping them under the threads. 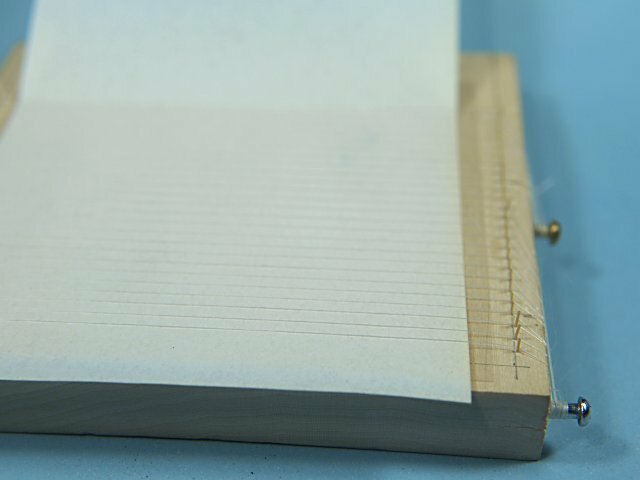 I then thinned down PVA white glue with water, and using a soft paint brush I laid down a thin layer of glue over nearly the entire paper, leaving 1/4" unglued near the outside edges. The paper warped a bit, and I had to be careful as the wet threads stretched a little, too much brushing moved them around and out of place. 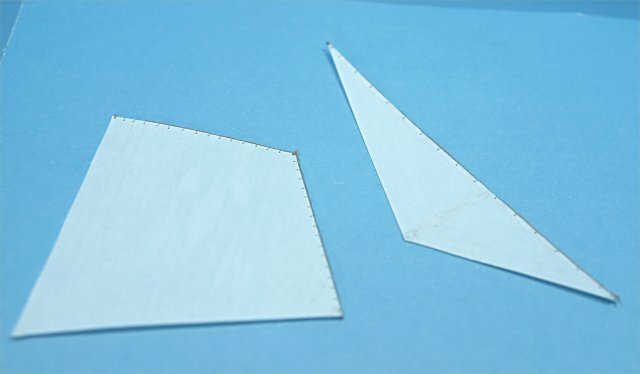 I then folded the other half of the paper over the first half, pressed it down by hand, then added another acetate sheet and finally a couple of "C" clamps to hold it all together. Over several attempts I found that too much clamp pressure flattened it all to the point where the ever so slight height difference over the threads completely disappeared, which ruined the effect. I finally found just the right clamping pressure to get the desired results. 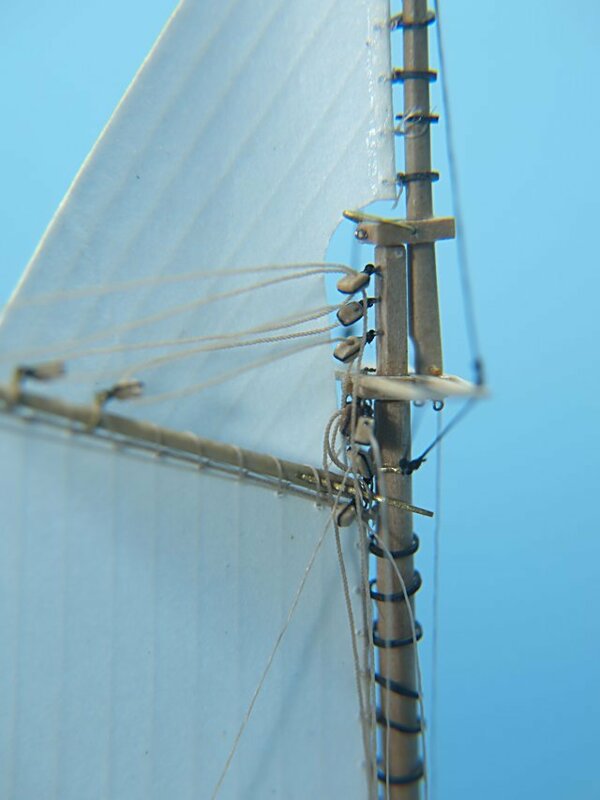 The last few photos show some completed sails, not easy to detect the seam lines on those, but the later photos show some of the sails installed, and the running rigging added, and here the seam lines seem just right to me. That's some beautiful looking sails you have made John. The time and effort you have put into them has all been worthwhile. As someone who has always struggled with sails they really impress me. A great idea and well worth the time and effort. Thanks Omni and Bernard! It was a struggle, tried various papers and thread colors before I found what worked. Glad you both think the effort was worth it.